The Worst POTUS in US history declares the Electoral College an outdated “vestige” of the past. It is no surprise that America’s most radically subversive POTUS has declared the Electoral College a nuisance, a quaint, presumably outmoded “vestige” of the past. Actually, the Electoral College is just one more amazing bit of our Forefathers’ genius and foresight, designed to protect us from “Community Organizers” like Obama and Bill Clinton’s deplorable wife. Today’s Democratic Party would be a shell without the tens of millions of “Organized” urban voters permanently hooked on those regular Dem Party Big Gov checks. 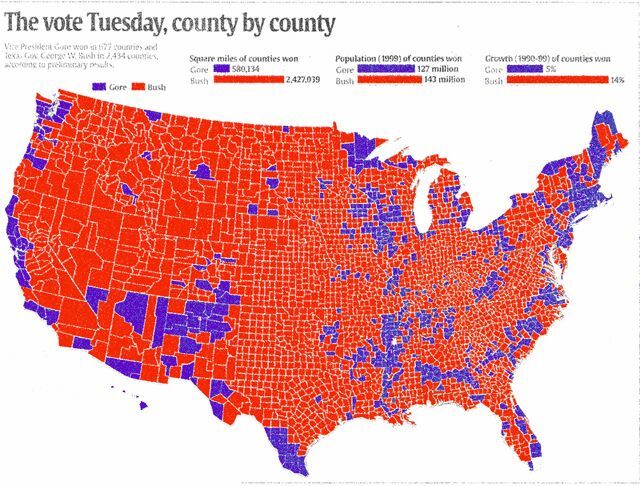 By no small chance, those hordes of “organized” Dem voters are concentrated in all our major urban centers. It’s nothing short of a miracle that men in the 18th century could foresee the danger of voting power deliberately concentrated in a few geographical locations, ignoring the presence of those hundreds of counties (and millions of independent individuals) in the hinterlands begging to be counted. These are the so-called Propertied Elite (and likely Republicans) Obama implies are the modern version of rich white slaveowners of yore who drafted that hopelessly outdated Constitution. 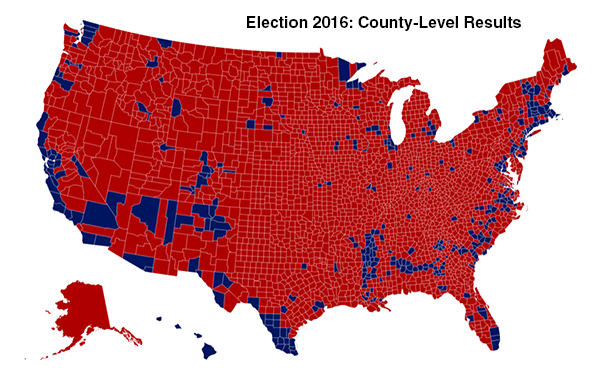 Perhaps this county-by-county map of Trump’s Electoral College victory dramatizes it best, much to the dismay of Power Mongers like our intellectual betters at the New York Times, Barack, Hillary and their Alinskyite confreres. Small wonder Barack and his slimy ilk have once again intoned that it’s time to abolish the Electoral College and rely upon a majority vote from their cultivated, growing masses of welfare dependents. A Hillary Presidency would’ve added untold millions of New Democrats (aka naturalized illegals) and a permanent voting majority. No great brain twister wondering why the Electoral College is considered such an obsolete “vestige of the past.” Read that to mean just another one of those inconvenient parts of the Constitution that stand in the way of absolute power. Thank you again, O Founding Fathers! Our best hope of continued defeat of the power-mad Left lies in identifying those blatant lies in which they excel and then repeat & repeat in sinister Goebbel’s fashion. As they now matter-of-factly declare the Electoral College obsolete, so they continue to preach that free, wealthy societies like ours are making the polar ice caps melt and that only a few specially skilled Marxists at the top can hold back a Biblical flood or earthquake or bad hair day. What other crises lie in wait for which they and only they can provide salvation? Should anyone be surprised that a Dem Party rescue always involves loss of freedom and a few confiscated trillions from our pockets? Whether banishing the Electoral College or the Global Warming hoax: if today’s Dem/Lib/Prog lips are moving, it’s a lie, a hoax and a fraud. 2 Responses to The Worst POTUS in US history declares the Electoral College an outdated “vestige” of the past.